Palais de la Culture, ancien siège du Ministere de l'Education et de la Santé, Rio de Janeiro is part of the Tentative list of Brazil in order to qualify for inclusion in the World Heritage List. 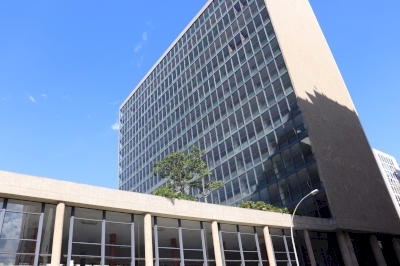 Also called Edificio Gustavo Capanema, this edifice was built between 1937 and 1945, is a fine example of Brazilian modernist architecture. It is located in the center of Rio, it is a 3 minutes walk from Cînelandia metro station. It was designed by a team of well-known architects including Oscar Niemeyer with a supervision by Le Corbusier. The gardens, including a garden terrace, were designed by Burle Marx. Three years after completion, it was inscribed as an historical monument, thus preventing alteration the original design. I visited the building in January 2019. It was still in renovation, with fences closing access to the building. Even though, most of the building features are visible, as it rests on ten-meter pilotis and has 16 floors of iron, concrete, marble, vertical glass, natural ventilation and lights. Some facade feature portuguese-style glazed tiles. The building was completely empty, without any offices or furniture in any of its floors. Renovations are planned until 2020. The building will then host the World Congress of Architects, and Rio will be named « UNESCO World Capital of Architecture ». That could be an opportunity for inscription, but Brazil has another site planned for 2020.